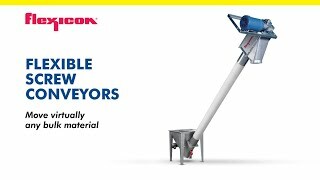 STUTTGART - At Powtech 2019 (April 9-11, 2019, Nuremberg/Germany), Coperion and Coperion K-Tron will present their versatile bulk materials handling solutions for various process steps at their booth no. 4-290 in Hall 4. For parts used in manufacturing processes in many sectors of the food, pharmaceutical, and chemical industries, the highest requirements in hygiene and purity apply. Moreover, frequent product changes and difficult product characteristics require regular wet cleaning. If cleaning expenditures can be minimized, companies can save significantly on time and costs. Coperion addressed these issues more than ten years ago, developing the WYK for powder and pellets, which was awarded the Innovations Award by the Powtech exhibition in 2006. 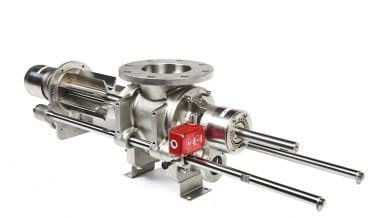 The diverter valve enables CIP applications to fulfill required criteria especially in the food sector that comes down to one thing: The diverter valve must be absolutely clean and free of contamination after wet cleaning — with no additional disassembly or manual cleaning. This saves time, effort and costs since manual post cleaning is not necessary. In doing so, the WYK diverter valve can easily be installed even at points that are poorly accessible. 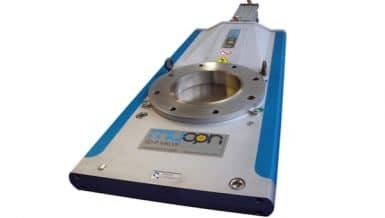 Throughout its inception, Coperion has continued to develop the WYK diverter valve based upon the collective experience of past years. Its innovative basic function has not changed: During bulk material conveying, the conical rotor seals the conveying pipes to each other. During CIP cleaning, the rotor is minimally pulled out of the housing and flushed by the cleaning fluid. Now, the diverter valve has been optimized according to current EHEDG guidelines (Class I EL certification is currently in process). Coperion redesigned and optimized the CIP-capable pipe sealing such that now operates with even the finest powders is possible. The pneumatic drives are separated — for turning and pulling the rotor, respectively — so that the rotor is supported on both sides. Along with its compact design, the diverter valve offers an improved cast design with increased surface quality. All materials conform to (EC) Regulation no.1935/2004 and the sealing materials are FDA-conform as well. 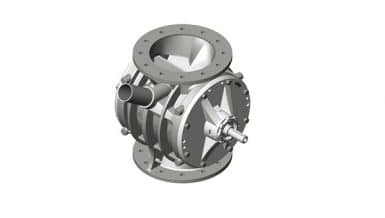 Moreover, further flange connections, such as those per DIN 11864, can be realized simply on the housing. 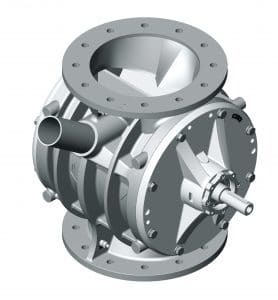 Coperion’s redesigned and optimized ZV rotary valve is now also available in sizes from 400 to 630. In comparison to its predecessor models, it excels above all with lower granulate destruction during operation. Coperion enlarged the inlet cross-section with additional pellet deflecting profiles. In doing so, an increase in throughput performance of up to 20% results.